And so begins the wonderful season of easy back-to-school make-ahead dinners! But seriously, EASY. Easy like should be embarassed but can’t even be because it’s so good. No cutting boards, no measuring cups or spoons (I’m the queen of eyeballing), and no fuss. I mean, I’m not headed back to school anytime soon, but I AM headed into a maternity leave this fall and I’m stocking up on those make-ahead meals like my life depends on it. Which it may? Time will tell. 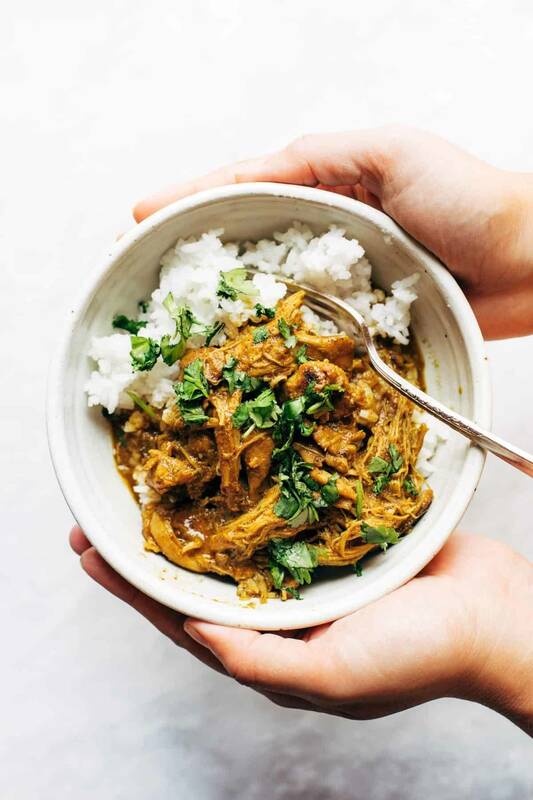 Being that this version is made in the Instant Pot or slow cooker, like any good make-ahead meal, this Coconut Tandoori Chicken is kind of automatically not real tandoori chicken. The “tandoor” in tandoori chicken refers to a special type of clay oven that the the chicken gets roasted in. Normally tandoori chicken has a nice crusty golden brown exterior from all those spices + that high oven heat. Mine does not, because we are skipping the tandoor / oven / grill situation in favor of something easier. While I’m not always up for a full-blown grilling moment, I DO have a pretty decent stash of spices, a package of chicken in the freezer, and a can of coconut milk sitting in the pantry at any given time. Enter: Coconut Tandoori Chicken. 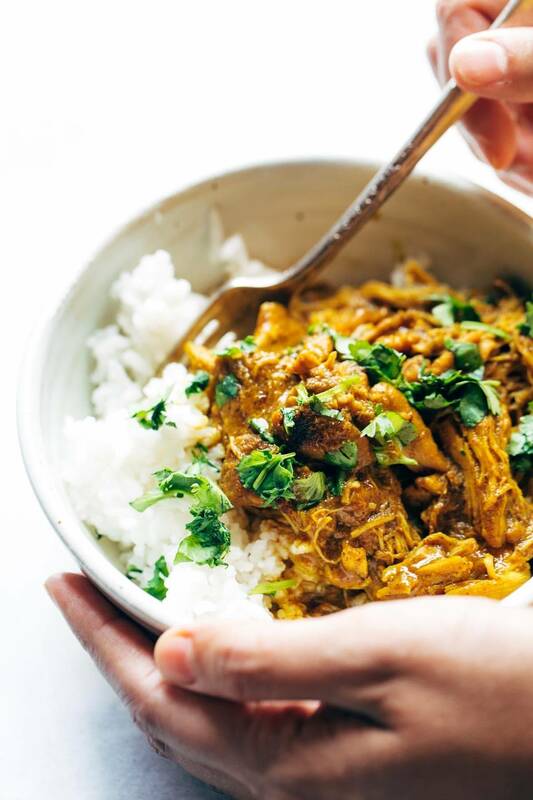 It’s creamy, fall-apart, juicy chicken thigh meat seasoned somewhat aggressively (especially if your roots are Scandinavian) with the warmth and depth of tandoori spices. So let’s talk about the make-ahead part of this recipe. Ready? It’s so easy. You just put everything in a bag and kinda mash it around. I told you I should be embarrassed. This is not fancy, people. Not fancy at all. Pop it in your fridge to make in the next day or two, OR freeze that bad boy for a future dinner. 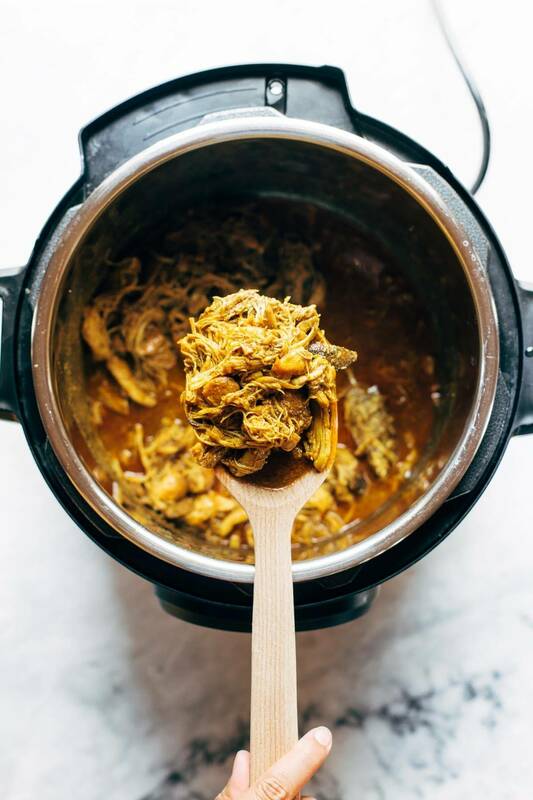 When you’re ready to cook it, you can either slow cook or pressure cook this magic, which becomes a shredded chicken situation that is brimming with flavor and coated in an almost gravy-like coconut curry-ish sauce. What are the best ways to eat Coconut Tandoori Chicken? Oh, FRIEND. Let me count the ways. It is kind of my new favorite. In and on everything. Expect to see this Coconut Tandoori Chicken making an appearance again soon in my MEGA DEEP DIVE post all about real food freezer recipes. Yes, that is happening. And yes, easy button lovers should be excited. Pst! Recipe inspiration for this recipe was from my friend Ali of the excellent Gimme Some Oven! Also, Authentic Chicken Tandoori recipes can be found here and here. Coconut Tandoori Chicken made with rich spices and creamy coconut milk. EXTREMELY EASY and so, so yummy. 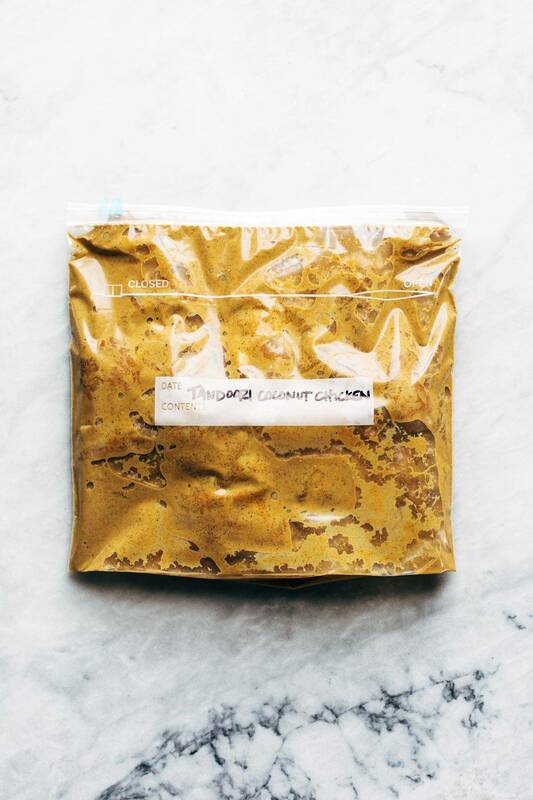 Freezer Version: Mix everything together in a freezer-friendly bag or container. Place in the freezer and store up to three months. When you’re ready to cook, follow the directions below! Instant Pot: Add everything to the Instant Pot. If it’s thawed, cook for 5 minutes manual high pressure + 10 minutes for natural release. If it’s frozen, cook for 15 minutes manual high pressure + 10 minutes natural release. Shred and serve over rice! Slow Cooker: Add everything to the slow cooker. If it’s thawed, cook for 4 hours on high, or 6 hours on low. If it’s frozen, cook for 6 hours on high. Shred and serve over rice! If you let the sauce stand for about 15 minutes before serving, it should thicken up slightly and take on the texture of a light gravy or curry sauce. I find chicken thighs are pretty small and usually cook quickly, but make sure you check to make sure they’re fully cooked if you are working with larger chicken thighs. I like to add a side of greens with this recipe to round out the meal – something like steamed broccoli, sautéed spinach, or a green salad. Want the freezer meal version of this recipe? Check out our full freezer meals post! Oh yum! I look forward to trying this recipe soon! I find that the Instant Pot is fabulous for Indian flavors. Such a great way to get a hearty, healthy, flavorful dinner on the table… after school! Many thanks! Can this be cooked in a conventional oven and for how long? I don’t own an instant pot or a slow cooker. I don’t know why not. Just think of it as braised chicken thighs. I’m sure you could find a recipe online to estimate cooking times if you think of the recipe as a braise. I used my normal oven and cooked for 3 hours on 150 Celsius fan forced and it was perfect! OMG i just am in love with this recipe. don’t even care that it’s not technically tandoori! the flavors are amazing (garam masala is one of my fav seasonings) and so easy. so eays. just perfect!! I’m not sure how you do it.. 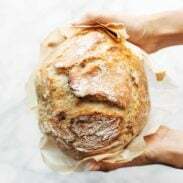 Most blogs, I’ll go days scrolling through their recipes with nothing really grabbing my attention or feeling worth the work, and yet everything you post is something I want to eat and need to make asap. I think it has to do with how delicious your food is combined with how simple the recipes usually are! I almost always have the majority of ingredients on hand. Thank you!! Could NOT agree more! Your recipes always GET me. This! 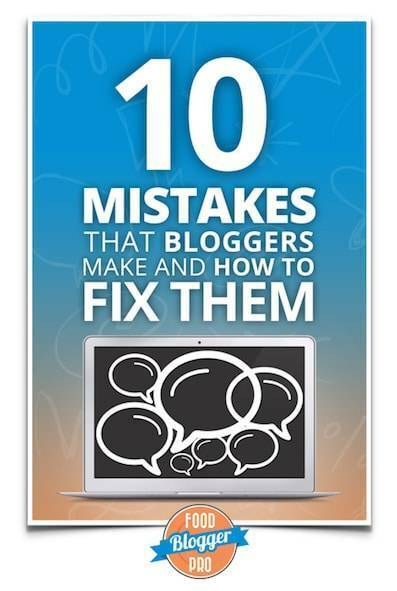 You and your blog are amazing! Wow….this is the complete pack of delicious recipes. Yummy tandoori chicken recipe. I liked your blog. Thanks for sharing with us. Keep it up! These flavors look amazing! Do you think it would work using tofu in the instant pot instead of chicken? Made this, substituting 2 packages of cubed tofu for the chicken, and it turned out delicious! I just cubed it and tossed it in. It turned out well, but that’s a great suggestion. I think it would probably taste even better pan fried to add a little more texture. If you want an Instant Pot shaped chunk o’ frozen dinner, folks have had good luck freezing in an old icecream bucket that slides into your pot (sizes vary). Takes up a bit more room in your freezer than flat packing, but then you can literally pop it in when you need it, since cooking from frozen is a thing with IP cooking. This sounds like a perfect meal for when you want something that tastes like you were in the kitchen for hours but you really want to be in there for like 10 minutes tops. I’m excited to make this! Oh My! All of these spices in one dish is heavenly. Also, I love how easy the recipe is. Thanks so much for posting! Ah! Love this (and your *evil laugh* lol). I got an instant pot recently and I 100% blame you! But I am very happy about it. Cant wait to see more of these recipes. Going back to school to become a nurse- these will come in SUPER handy!! Thanks as always Linsday. Thanks for the comment, Tamara! Currently making this (was so incredibly easy)!! Will let you know how it turns out! Maternity leave in the Fall? — Congratulations and Best Wishes are in order. Many will be thinking of you, I’m sure. Frankly say, its new to me. Haven’t tried before. I am gonna try this recipe this weekend. Are those tablespoon measurements for the spices correct? Seems like a lot of chili power, in particular, to me? Yes…measurements are correct. The sauce is heavenly! I found this to be too salty. I love all things pinchofyum but this one had too much salt and a very coarse texture when eating it. Thanks for all the great recipes! I want to make it. Thank you so much. Hey LIndsay, this sounds so excellent, but do I set my electric pressure cooker on high or low pressure for this recipe? I have a different brand than the Instant Pot. I did high pressure in my instant pot. This recipe was delicious!!! Super fast and super easy. It’s on the menu for next week! I’ve planned it with some cauliflower rice and I’ll probably throw in some frozen peas while it rests along with a handful of spinach because, you know, green stuff. This looks amazing, and I can’t wait to read more in your freezer recipes MEGA DEEP DIVE! WOW! 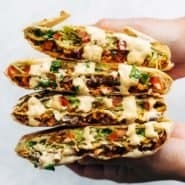 This looks so delicious and sooo easy! I can’t wait to try it out! Just came upon this today as I was looking for instant pot chicken recipe. We love Indian and it was perfect!! I may make it with less cayenne so the kids will tolerate the kick, but I loved it just as it is! It made enough for leftovers so I’m excited for lunch tomorrow. I look forward to searching your other recipes! Hi! This is going to be my first InstaPot recipe. Would you please explain more in a step by step process using the pot? I just made this and all I did was throw everything in my Instant Pot. Ran it on manual for 7 minutes, then let it cool for 10 minutes before releasing the pressure. It was delicious! plan on buying some chicken thighs, have everything else. The recipe says cook for 5 minutes, why did you do 7?